I've stayed in Hilton Hotel many times. But DoubleTree Hilton, this is the first time. 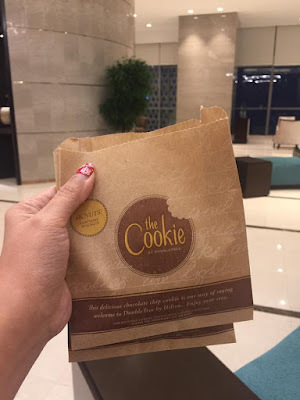 When we first checked-in, it was a pleasant surprise to receive a warm cookie at the receptionist while there was a heavy storm outside. The warm cookie quickly lights up my mood. After checking with my friends, I found out that the warm cookie is only given out to guests at DoubleTree. The first thing that I notice when arriving at the hotel, is the spacious lobby and waiting area. The luxurious furniture and unique art designs are accents to the signature Hilton's affluence. The check-in area is located at Level 12. You'll be sure with a peaceful and speedy check-in without the other guests hanging out. They separate the entire waiting area at Ground Floor and the check-in area on another floor. Not just the lobby that is spacious. It is perfect for a family. Kids will love this hotel because of the Kids Club facility, which is a huge playroom filled with activities. The room is an entire studio apartment itself. The bedding is crisp clean with modern furniture. What I love the most about staying at Hilton is the various options for pillow. There are foam, cotton and feather pillows so that you will have a good night sleep with your own preference. And if you're a Hilton Honor club member, they will surprise you with some handcrafted sweets. The facilities in the hotel exceeded my expectation. It comes with a fully equipped gym which is just as big as commercial gyms. There is also a steam room and a sauna room. I was really surprised to see a huge locker space with vanity just like any clubhouse that you would pay a huge fee. The pool isn't the most impressive facility, but the infinity view comes with a beautiful landscape of the World Unesco City. The hotel has three dining spots - a lounge to chill, Makan Kitchen that serves a wide range of local cuisines & Tosca, a swanky Italian restaurant right next to the pool. I regret not having enough time at the hotel. We checked in at 8PM and left immediately at 7AM. There wasn't much to explore with so little time. I want to go to the Kids Club and Sauna. I didn't even have the time to dine there. But I do plan to go back there again if there is any chance. The DoubleTree Hilton has raised the bar for all the five-stars hotel in Melaka. It is definitely one of the best in town for now.